The Hilti PR 2-HS Rotating Laser Kit is part of Hilti's innovative new product technology that makes it a global leader in the construction industry. Featuring a shock-absorbing casing, the Hilti PR 2-HS Rotating Laser Kit is built to withstand the harshest jobsite conditions. Simple function buttons make this tool incredibly user friendly, and Hilti Pulse Power technology allows for highly reliable readings, even in bright light. Its main applications involve checking and transferring heights, leveling and adjusting formwork, and setting slopes. Whether setting slopes, transferring heights or leveling, the Hilti PR 2-HS Rotating Laser is the right tool for your job. Accuracy of plus or minus 0.02 in. 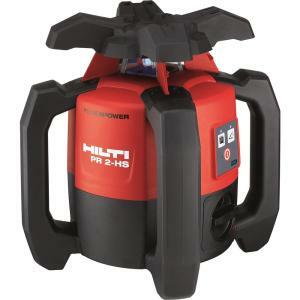 at 32.8 ft.
Tbook.com crawls the web to find the best prices and availability on Levels and related Tools and Hardware products like Hilti PR 2-HS Rotating Laser Level Kit. For this page, related items include products we find that match the following keywords: "Level" at our vendor partner Home Depot. Hilti PR 2-HS Rotating Laser Level Kit is one of 154 Levels and related products listed in the Tools and Hardware section of Tbook.com If you have any questions on this product, please give us a call at 734-971-1210 during the hours of 9am - 5pm EST for assistance. Thank you for shopping at Tbook.com, the Internet Department Store!